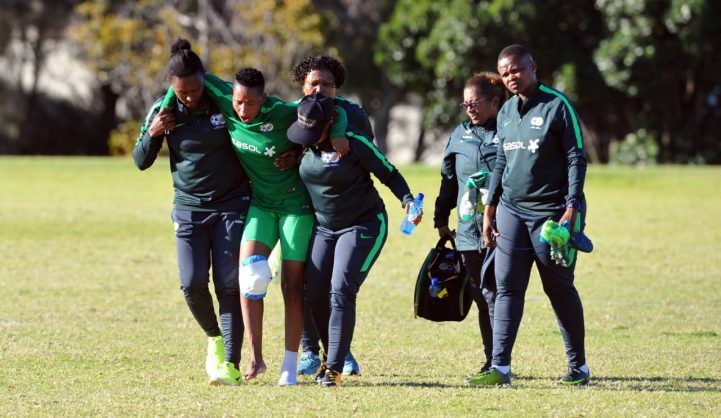 Chantelle Essau walking off the field with an injury assisted by members of the Banyana Banyana medical team. The team has suffered a major blow ahead of their opening Cosafa Women’s challenge tie. Chantelle Essau becomes the third player to be withdrawn from the squad after Melinda Kgadiete was found not to be fit to take part in the tournament and her replacement Tiisetso Makhubela was also ruled out of the competition because of a groin injury. Head coach Desiree Ellis has since called up Gabriela Salgado to replace Essau and said it was unfortunate to lose the striker, however, it is an opportunity for Salgado to step and show why she was selected. Ellis said: “That was a bad one for us especially on the eve of the tournament and she was getting back on form and we know what she is capable of. Unfortunate for her, but it happens in sport and I think things like that bring the team and unity together. Banyana starting XI against Madagascar: Andile Dlamini, Lebohang Ramalepe, Noluthando Vilakazi, Kgaelebana Mohlakoana, Regina Mogolola, Khanya Xesi, Jermaine Seoposenwe, Bambanani Mbane, Refiloe Jane, Nompumelelo Nyandeni, and Thato Letsoso.